In collaboration with John Wisden & Co, India's premier statistical and informational annual, Wisden India, is, with its 2016 almanack, now into its fourth year. M.S. 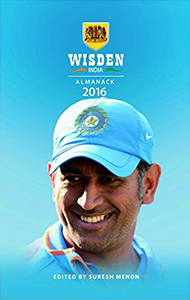 Dhoni's usual smiling face adorns this fourth edition's cover and, within the almanack, a similar layout to the yellow Wisden informs readers of the previous year's events. Concentrating naturally on Indian cricket, Wisden India does not however confine itself to just cricket within India and Asia but covers much international cricket played in other countries. Similar in style to the Wisden Almanack, there are many interesting articles whilst mentioning little titbits. Dhoni comments at the end of the book that he has missed just one game of cricket and that was to become engaged to his fiancee, Sakshi, who was told that cricket is his life and main priority. Who knew that the Under-19 Vinoo Mankad Trophy "was stalled after the zonal round because of reasons left unexplained by the BCCI"? Many interesting articles in the first part of the almanack include an earlier article written by India's first overseas Test centurion, Syed Mushtaq Ali. Another includes the tragic demise of Phillip Hughes. It is sad to see in the Obituary section that the late Australian was not the only person to die on a cricket ground during the year. The Five Cricketers of the year are made up of one Indian (Ravichandran Ashwin), an Englishman (Joe Root), a Pakistani (Younis Khan), a Bangladeshi (Mashrafe Mortaza) and a Sri Lankan player (Dhammika Prasad) whilst the Cricketer of the Year, R. Vinay Kumar, may not be a household name but his captaincy helped put his state, Karnataka, back on to the cricketing map. Wisden India is once again a must for any cricket lover.